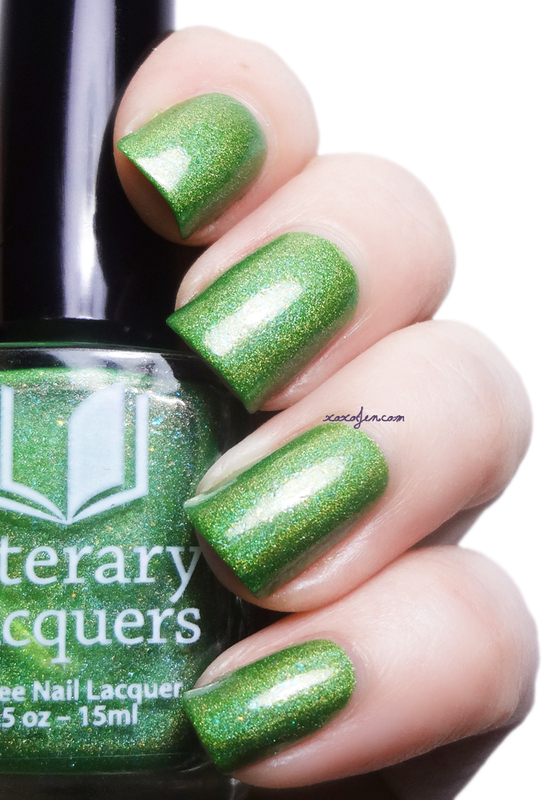 Amy of Literary Lacquers started a holiday tradition last year by joining with the community to create a collection of polishes and you may remember my series of posts about them: 1, 2, 3, 4. I was so excited to get to review that collection and thought how awesome it was of Amy to include her fans to make a holiday collection. Well guess what!! 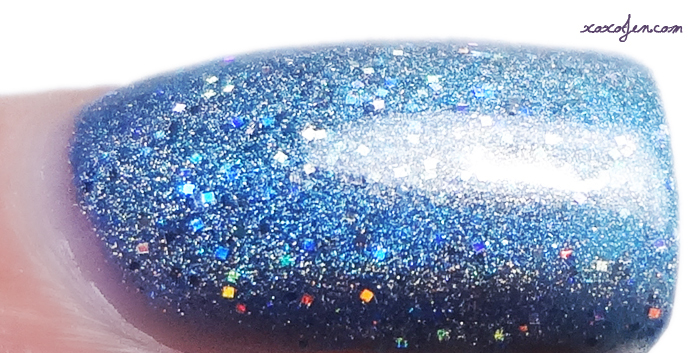 Amy asked me to design a polish for this year's community collaboration! At that moment my jaw dropped; stunned and speechless at the thought of being part of the collaboration among many other much more talented ladies. 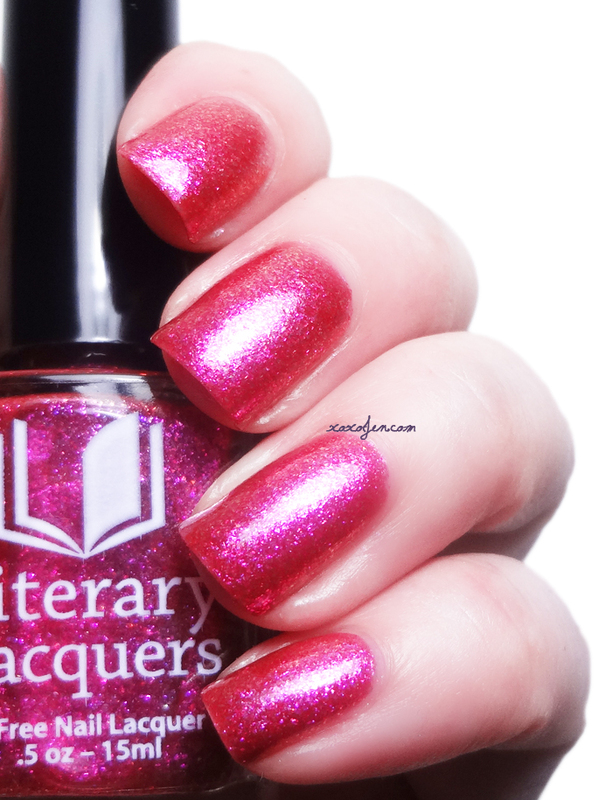 And when I first saw the polish Amy created from my idea, I was in tears because Amy went above and beyond what I had expected. It's gorgeous, ya'll. I have always admired the passion that Amy puts into every bottle and to be a part of something this wonderful really touches my heart. I am honored and very excited! So here's the whole eight piece collection - each and every one of them is very special from inspiration to inception. 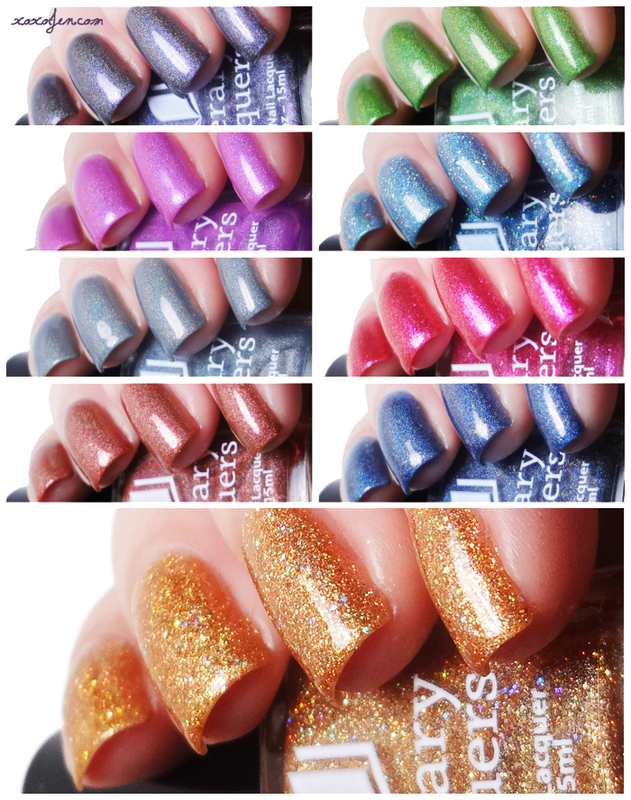 I wore two coats of each polish for all photos. 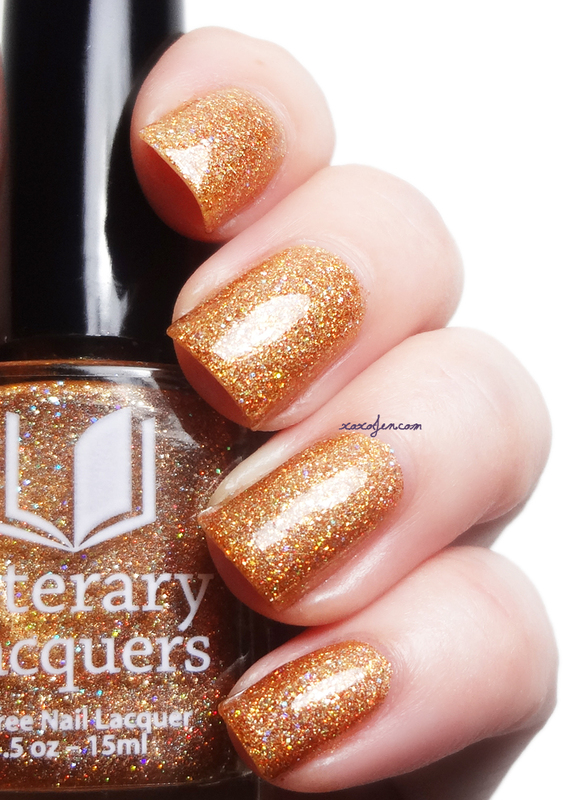 These align with the Literary Lacquers formula we've come to expect - consistently smooth, almost buttery easy to control application. 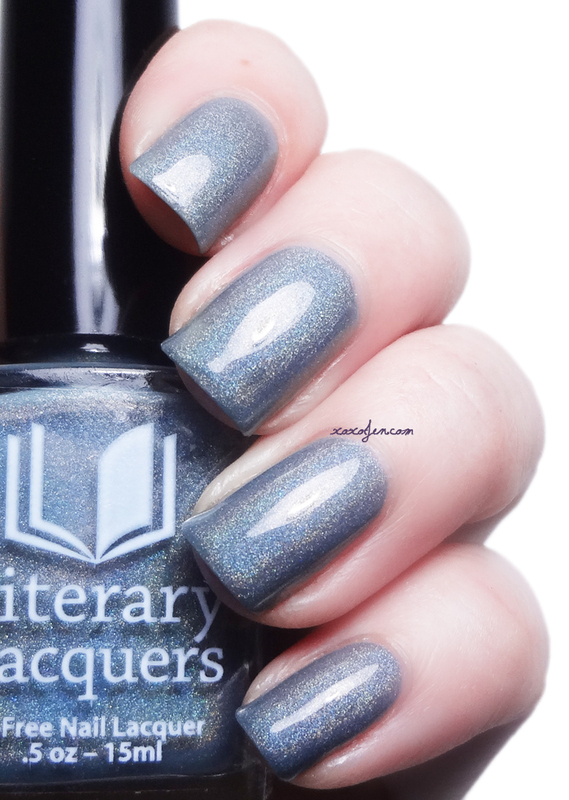 I've used the descriptions provided by Amy, but added a little more detail to Lurid Fog, the polish I helped design. 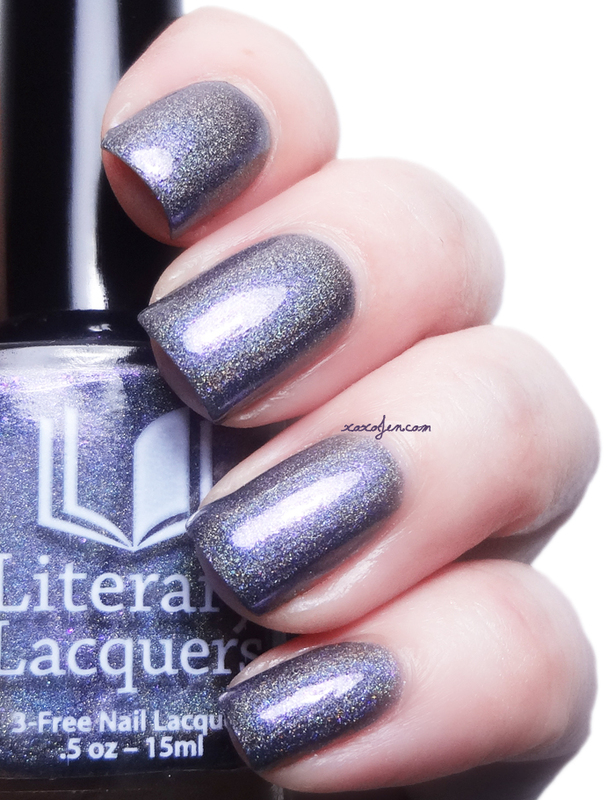 Lurid Fog – Designed by Jen of xoxo, Jen – A slate grey linear holo with a strong purple shimmer from two different sized pigments. Arrived in Hampstead Road he offered his hand for good-bye. He jumped out, and waved his hat in the lurid fog. 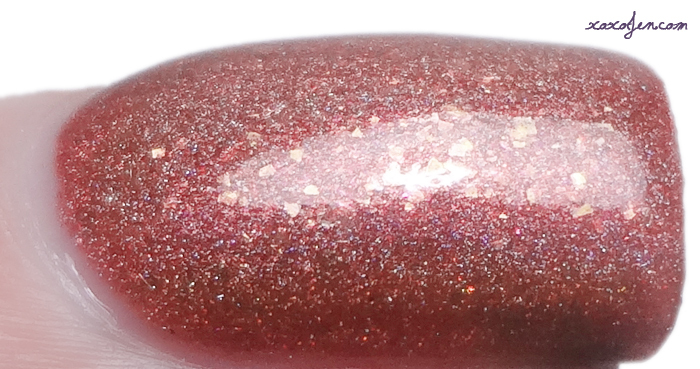 Not only did the polish turn out better than expected but Amy sent an extra bottle to me to do a giveaway along with the LE gift with purchase, I Heard The Bells. The link to the giveaway form is at the bottom of this post. 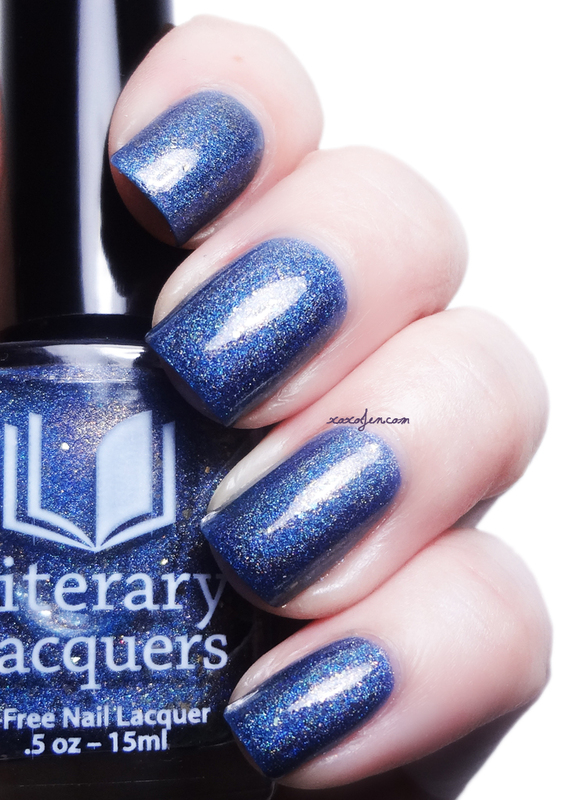 Fallen Tributes – Designed by Jennifer of 4Boys1Mom Lacquer – Inspired by The Hunger Games, a deep blue linear holo with gold flakes and copper shimmer. 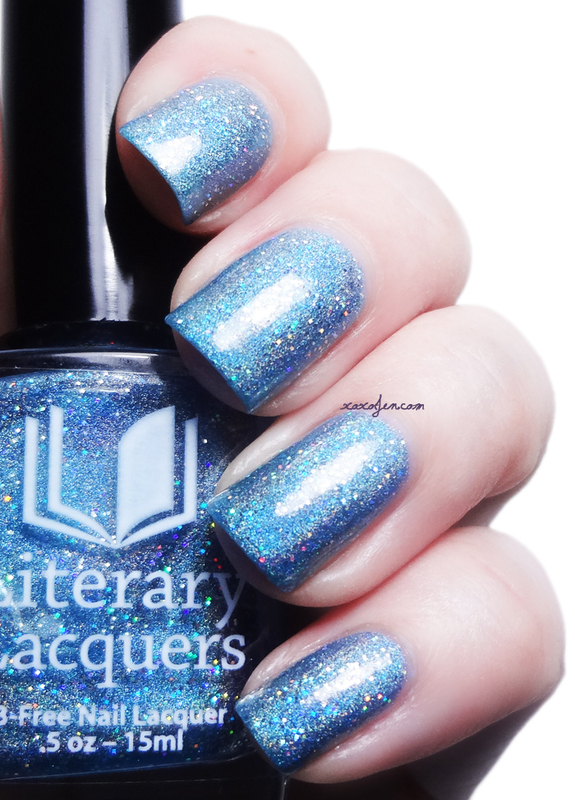 Always Winter Never Christmas – Designed by Kirby of The Mercurial Magpie – Inspired by The Lion, the Witch and the Wardrobe, a silvery blue mega glitter linear holo. Kirby has pusblished her entry for the collection, so be sure to read more about her inspiration at http://www.themercurialmagpie.com! I Heard the Bells is a bonus Limited Edition Gift with Purchase. This polish was inspired by the poem I Heard the Bells on Christmas Day and is a bronzy-copper mega glitter holo. 1pm Central time, November 28. Use coupon code for free US shipping BLACKFRIDAY2014 or INTERNATIONAL2014 for $5 international shipping for purchases over $80. If you enjoy reading my page, I would also be most grateful if you'd follow me on your favorite social media too! Great job on the polish! I will definitely be buying this collection and it will be special to me as so many folks I adore are represented in this year's Community. Yay! Thanks again for your help, I truly appreciate you! I'm really loving your swatches! You did an amazing job! They're all gorgeous, but especially yours! Not at all, eh? LOL Thank you for the compliment Jammies! :D Right on! And thank you so much for the comment! The collection is quite lovely. Your shade is gorgeous! You did a great job. Lurid Fog and Always Winter Never Christmas are my favorites. All are beautiful though! 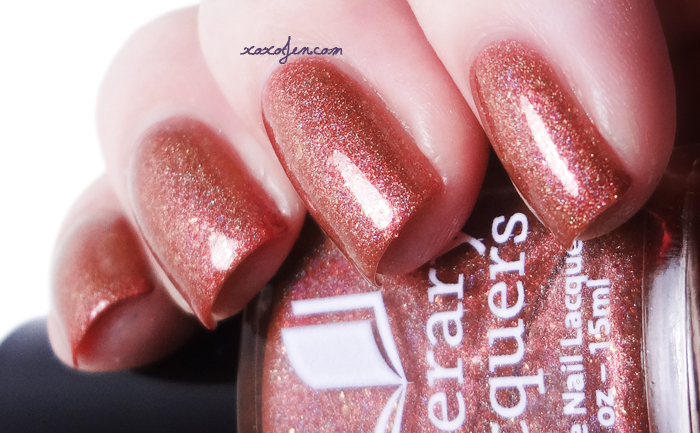 So glad Lurid Fog is one of your favorites! Thank you!